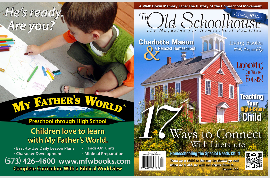 Have you ever read The Old Schoolhouse® Magazine digital edition? We invite you to take a sneak peek at the FULL-LENGTH VERSION of our Summer digital issue. This is our most recent edition, valued at $5.95--our FREE gift to you. This issue has just been mailed hot off the press to our print subscribers. They haven’t even seen this fresh and exciting edition yet! When you find something this wonderful, it’s just hard to keep it to yourself. We know that’s exactly how you’ll feel after you’ve browsed this free issue and explored the special features of our digital edition.